Bulgarian Oracle User Group (BGOUG) 2016 : It’s a Wrap! As part of this event I put out the following blog posts. I’ve already said it, but my thanks got out to Milena and all the BGOUG folks for inviting me once again. Thanks to all the attendees. Thanks as always to the Oracle ACE Program. See you all again soon! A group of us were being picked up by a minibus at 09:50 for the trip back to the airport. Timo Raitalaakso and Gianni Ceresa were on the same flight as me for the first leg. We said our goodbyes to everyone in the hotel lobby, then it was off to Sofia airport. The airport was very quiet when we arrived. We checked in and dropped off our bags, then walked straight through security. It really doesn’t get easier than that. Timo, Gianni and myself then sat and chatted until the it was time to board. The flight to Munich was listed as a two hour flight, but I have no idea how long it actually took. I was reading a novel written by one of my friends during the trip. The guy a couple of seats along was snoring so loud it kept making me laugh. I’m not sure how anyone could sleep in the same house as him! We arrived at Munich, where I said goodby to Timo and Gianni, before trudging around for quite some time trying to find my gate. It was a 1:40 layover for me, so it wasn’t a rush. 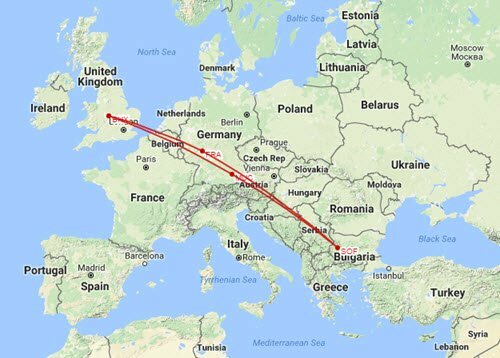 The flight from Munich to Birmingham was another two hour flight. I spent the journey reading again, so I didn’t really notice much about the flight. Back in Birmingham, I got my case and took a taxi home, while continuing to read my book. By the time I got home I was feeling quite drained, so I went to bed early, ready to start the working week! That marked the end of my last international event of the year and I’m looking forward to spending some time at home in a single timezone. The last few months have been a killer! I planned to go to breakfast for a few minutes and then hit the gym. I got caught up in conversation during breakfast and several hours later the gym was not an option. Next up was me with “Pluggable Databases – What they will break and why you should use them anyway!” This session is getting increasingly difficult to present as I pick up new stuff about Oracle 12.2. Once I’ve spent some time on 12.2 I will revise this session and the associated article. I think it is still relevant in the 12.2 world, but it may need a little tweaking. I spent some time chatting to people before the last session of the event, which was called “Discussion Over Beers About Oracle Database” with Joze Senegacnik, Martin Widlake, Bryn Llewellyn and myself. Most of the session was a discussion of cloud and what it means to the current batch of DBAs. As Bryn pointed out, it is quite a hard subject to talk about when everyone in the room seems to have a different definition of what cloud means. Added to that, I’m not sure I know what job is currently described by DBA, as mine seems to be very different to everyone elses. Big thanks to Milena and all the BGOUG folks for inviting me and making my stay so effortless. Thanks to all the attendees. This conference is going from strength to strength! Thanks also to the Oracle ACE Program for letting me fly the flag. I woke up, went down to breakfast, then went off to the gym. By the time that was all over I felt totally knackered. I headed down to register and quickly moved to the first talk of the day, which was Martin Widlake with “The Heart of Oracle – How the core RDBMS works”. As the name suggests, this was a romp through the basics of how the Oracle database does what it does, which by his own admission included some over simplifications. As a presenter it’s easy to get caught up in trying to present “cool stuff”, or trying to “impress your friends”. It’s easy to forget about the newer folks who aren’t coming to the conference with all the basics in place. These days, there’s a lot of “experienced” people who also don’t have all the basics too. 🙂 I like this type of session and I think there is an audience for it. After the session I was feeling very drained. The recent time zone changes and a night of broken sleep (body clock related) got to me, so I parked myself in the hotel lobby, caught up on some blog posts, video editing and then turned my brain off to do some mindless admin stuff I’ve been putting off for a couple of months. I feel kind-of guilty coming to such a great conference in such a beautiful place and not taking full advantage of it, but I’m in survival mode at the moment. I met up with some of the folks over lunch and went outside (yes, outside) for the group photo, then it was back to the lobby for a while until my session. I did my “It’s raining data! Oracle databases in the cloud” session, with some live demos of Oracle Cloud. Depending on my mood, this session can sometimes be rather upbeat and at other times be rather cynical of cloud in general. This one leaned more towards the cynical side. I think cloud is a very valuable tool when used correctly. It is not the solution to all problems that some people would like you to believe. Doing my session brought me back to life. There was a gap between the last session and the evening’s festivities, so I went to the gym again. It was either that or lie in my room and I would definitely have slept through the party. After a while the singers returned to do some more pop-style numbers, which kept the crowd going and then it switched to a DJ playing pop songs and people dancing. This is my sixth visit to a BGOUG events and ever since my first I’ve described the events as being like a family wedding without the fights. I spent the evening with a smile on my face thinking, I really need to come back more often! The people are so happy. The male/female ratio is always the best you will see at a tech conference. It feels like coming home. I went to bed at about 00:00 with the party still in full swing. I pretty much put my head on the pillow and fell into a coma until 06:00 this morning. At that time in the morning the roads were clear so the drive to the airport was super fast. The airport was very quiet, which was a bit of a surprise as most of the cheap flights leave at silly times, so often the early starts are very busy. After walking straight through bag drop and security I parked myself at a cafe and opened my laptop. The flight to Frankfurt was short (75 mins), quiet and uneventful, but there was always a nagging doubt in my mind. My stopover in Franfurt was only 65 minutes. Depending on gate locations, getting between gates at Frankfurt can take longer than that. Luckily I was at the front of the plane, so I was able to get off quickly and rush to my next flight. The flight from Frankfurt to Sofia was only a couple of hours. Once again, pretty uneventful in itself. Once I was in the hotel, I went through the usual routine, film the hotel and my room and put everything on charge ready for the next day. 🙂 The hotel is very grand! I’m on a bit of a fitness kick since my APAC Tour, so I headed off to the gym, but was delayed for some time chatting to the guys, but I did get there in the end. In the evening we went to the hotel restaurant for food. At about 10:30 I excused myself and crashed for the night. So that’s the OTN APAC Tour 2016 over for me. Most of the other folks are zipping across to China and India, but I had already committed to another event in Europe, so I had to cut the tour short. During the tour I produced the following tour-related blog posts, most of which include silly little videos. OTN APAC Tour 2016 : It’s Nearly Here! Thanks go out to NZOUG and IAOUG for letting me come to play, as well as all the attendees that came to play too. 🙂 Thanks as always go out to the Oracle ACE Program for making this possible for me! I woke up early, feeling kind-of nervous about the trip home. Approximately 24 hours on a plane, plus several hours in airports is not my idea of fun. My first flight started at about 17:10, but I had to check out of the hotel at 12:00, so I spent a few hours sitting in the hotel lobby, trying to do something useful. The first bit of stress for the day was my bags were not checked through to Birmingham, so I had to pick them up in Sydney and put them through security again. All of a sudden the connection time didn’t seem so cool. The flight from Gold Coast to Sydney was straight forward and arrived on time, so I got my skates on, got a train to the international terminal, and moved through check-in, bag drop and security pretty quick. There were no upgrades available, but at least I got there on time. 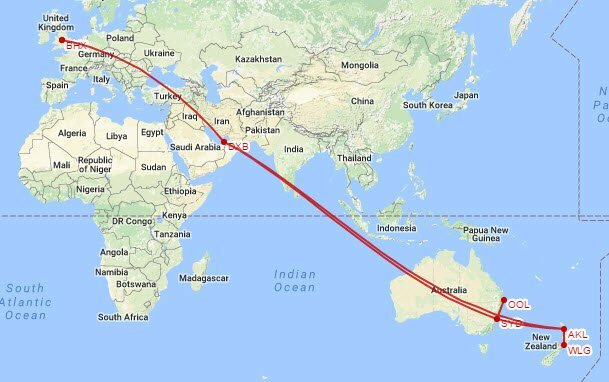 The flight from Sydney to Dubai was on an Emirates A380, which had a reasonable amount of room on it. I stood up a lot and did some stretching at the front of the plane. I was actually able to get the laptop out for a bit and do some video editing. I also managed a bit of sleep too, which is very rare for me sitting upright. All in all, not a bad experience. Of course, with those massive planes the boarding and getting off takes a lot of time. I had a 2 hour stopover in Dubai, but by the time I had done security and got to the boarding gate is was half that. It never ceases to amaze me how people think it will be a good idea to get groups people travelling together to congregate in the middle of where everyone is walking, or often at the foot of an escalator. It’s so stupid and it makes me really angry. I feel like punching and kicking my way through the ignorant bunch of idiots. On the flight to Birmingham I had a bulkhead seat, so I had extra leg room. There were quite a few seats free on the plane, including a spare one next to me, so I was able to relax a bit. The flight itself was fine, but during the last 2 hours I really started to suffer. There is only so much sitting on a plane the body is capable of and by 2 hours to go I was becoming a little erratic. I just kept fidgeting and twitching. It was a massive relief to get off the plane and know I was done with flying for a few days. It was an early start. I was awake at about 03:00, playing catch-up with all my real-life stuff, then it was off to the Gold Coast event. The day started with a keynote by Stu Keast called “Oracle ERP Data Maintenance Made Easy”, speaking about More4Apps solutions. The rest of the day was split into two tracks, with the following sessions. Thanks to everyone at IAOUG putting this event together on relatively short notice. Thanks to everyone who came and supported the event. Thanks also to the ACE Program for getting me here! I spent the morning chilling out in my room and catching up with real life. At about 11:00 I checked out of the hotel and got the train to the domestic airport for my flight to Gold Coast. Safely down, we picked up our bags and got a taxi to the hotel, which was pretty posh by my standards. We were meant to meet up to get some food later, but I took a quick walk to see the beach, then felt really drained and went to bed. There is something about airports that sap your will to live. That combined with the heat and humidity of Gold Coast and I was the walking dead. So in a couple of hours it’s time to start my last event in this tour before I fly off home. By the time I was ready to move to another session, it was my turn again. This time with “Improving the Performance of PL/SQL Function Calls from SQL“. I was happy with the way the talk went, and once again I got people speaking to me after the session, which was good. Next up was Connor McDonald with “Big Data – A database dinosaur’s point of view”. Connor always puts on a good show and his session went down really well with the crowd. It was targeted perfectly for a bunch of Oracle DBAs and developers. The final session I went to for the day was Connor again, this time with “New Features in the Next Generation of Oracle Database“. This was a variant of the session I saw him give at OOW16, and not surprisingly it went down well with the crowd too. By the start of this event I was more used to the time zone, so there was less adrenaline and caffeine involved in getting me out in front of people. As a result I felt a lot more chilled out for this event. That’s no reflection on the previous events. Just how I was feeling at this point in time. As with all one day events, it was over almost before it began. 🙂 Thanks to everyone at IAOUG for inviting me to event. Thanks to everyone who came to my sessions and came up to talk to me during the event. Thanks also to the ACE Program for getting me here!